On January 28, 1820, architect Ithiel Town was granted a patent for a wooden truss bridge, also known as Town’s Lattice Truss. An architect and civil engineer, Town had already built the first covered bridges to span the Connecticut River, one at Hartford and two in Massachusetts at Springfield and Northampton. He based all three on the wooden arch truss patent design of Theodore Burr. Town’s innovative lattice design evolved from this experience; he recognized the need to be able to build bridges quickly, out of readily available materials with local, relatively unskilled workers. Town’s innovation included a support system based on an uninterrupted series of crisscrossed diagonals that connected the horizontal top and bottom chords to form a series of overlapping triangles. Unlike the use of the arch in Burr’s design, Town’s approach distributed the load equally with no vertical timbers. By fastening each triangle at its points of intersection, the design prevented any one structure from moving independently when subjected to stress. This distributed the load borne by one triangle across all of the others. Not only was Town’s method of load distribution more efficient, it could also be achieved with lighter-weight planks of pine or spruce connected with wooden pins. The resulting structure was much lighter and considerably less expensive to build than an arch truss bridge. The light, almost insubstantial, appearance of Town’s bridges prompted comparisons to the common trellis found in every flower garden. Town built a small bridge in Whitneyville, Connecticut, to introduce his design. The ease of construction, strength, and ability to build a lattice truss bridge on piers spanning long distances quickly made the design the common choice for covered bridges and early railroad bridges until the post-Civil War era. Town’s bridge design accommodated early trains simply by doubling the quantity of planks and pins. The lattice truss bridge became so widely used across the eastern states in the 19th century that Town, who received royalties of $1 to $2 dollars per foot for use of his patented design, became a wealthy man. Bull’s Bridge in Kent and the West Cornwall Bridge in Cornwall and Sharon are Connecticut examples of Town’s truss design. Town, Ithiel. 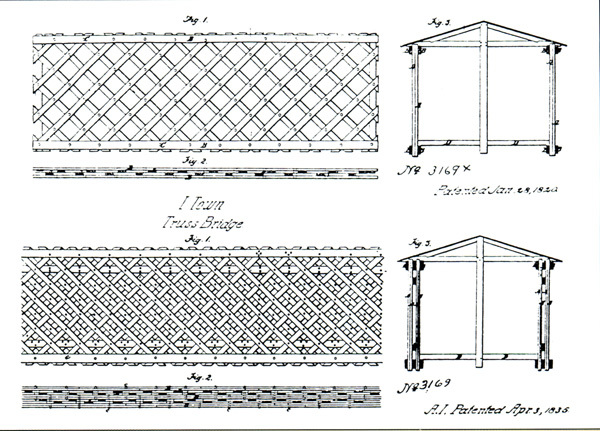 Patent Number 3,169X - Truss Bridge. 3,169X, issued January 28, 1820. Link. “Town, Ithiel: MSS 105 - Alphabetical Index of Manuscript Collections.” New Haven Museum, 2017. Link. Town, Ithiel. Some Account and Description of Ithiel Town’s Improvement in the Construction and Practical Execution of Bridges, Aqueducts and Rail Road Bridges, Whether Built Entirely of Wood, or of Cast or Wrought Iron. New York, 1831. Link.